Practice the questions given in the worksheet on multiplication table of 24. 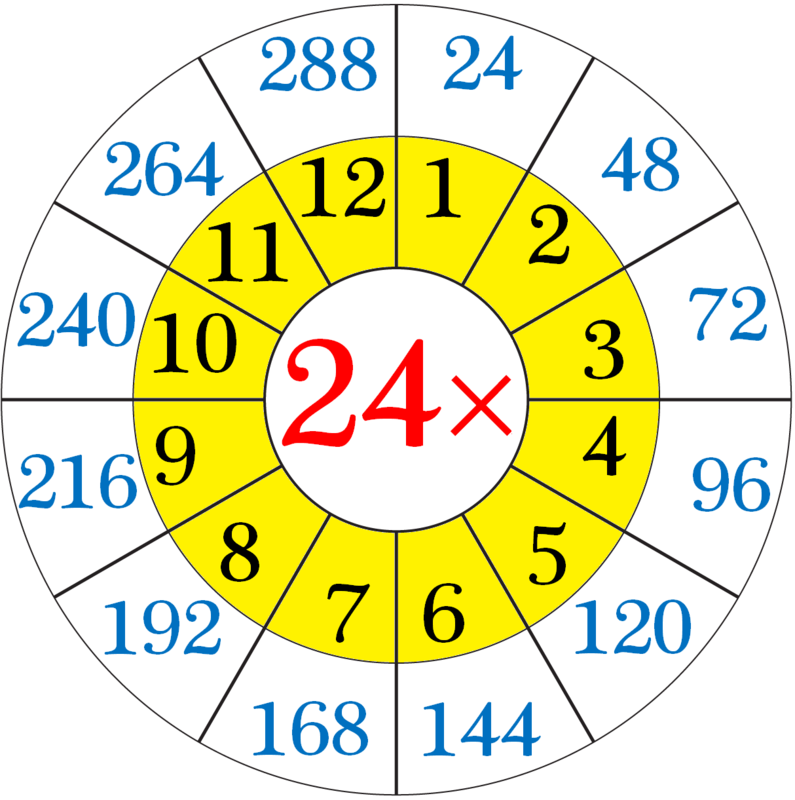 The questions are based on finding the product using the multiplication table of 24. 1. Count forward by 24’s from 24 to 480. 2. Count backwards by 24’s from 480 to 24. 4. Find each product using above multiplication table of 24. 5. A carpenter works 7 hours a day. How long does he work in 24 days? 6. A cyclist covers 24 km in one hour. How much distance will be cover in 5 hours? 9. (i) What are 24 tens? (iv) Twenty- four times 5? (v) What are 7 times 24? (ix) What is 24 multiplied by 3? (x) 7 multiplied by 24? 10. What does 24 × 12 mean? What number is it equal to? 11. If a tin of chocolates weights 8 kg, find the weight of 24 such tins of chocolates? 12. What will be the total length of cloth required for 24 pants, if for each pant 2 m of cloth is needed? 13. (i) How many twenty-four’s in 96? (ii) How many twenty-four’s in 168? (iii) How many twenty-four’s in 216? Answers for the worksheet on multiplication table of 24 are given below to check the answers of the above multiplications. 1. 24, 48, 72, 96, 120, 144, 168, 192, 216, 240, 264, 288, 312, 336, 360, 384, 408, 432, 456, 480. 2. 480, 456, 432, 408, 384, 360, 336, 312, 288, 264, 240, 216, 192, 168, 144, 120, 96, 72, 48, 24. 10. 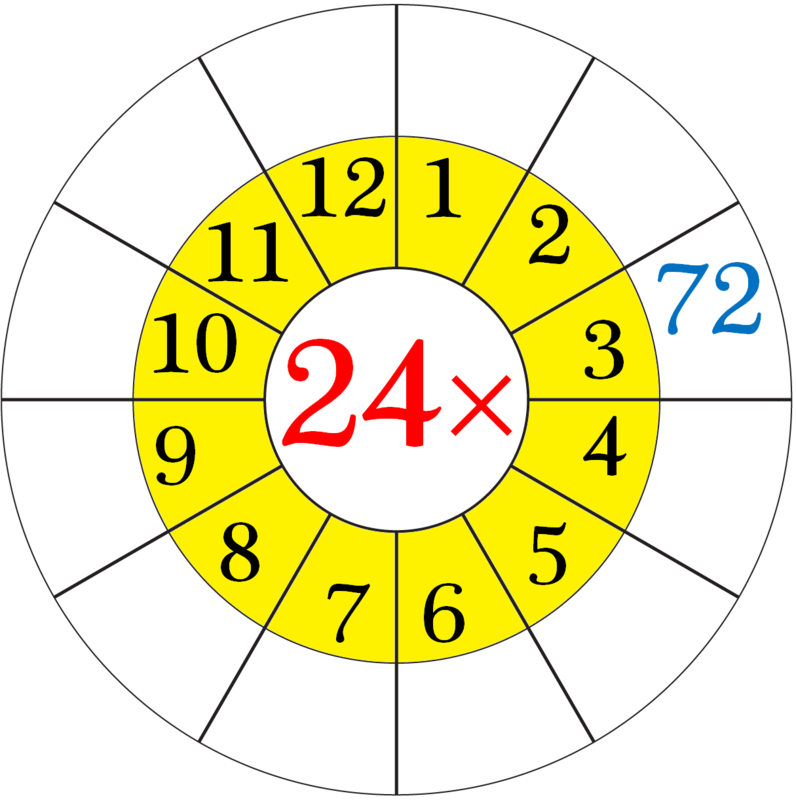 24 × 12 means that the 24 and the 12 are multiplied together or ‘twenty-four twelve’s’ or ‘twenty-four times twelve’.